Is designed to Securely 3-Way Guy at 3 levels your ROHN H30 and Channel Master 1630, 1830, Telescopic Masts. Choose Guy wire gauge and Anchor size. 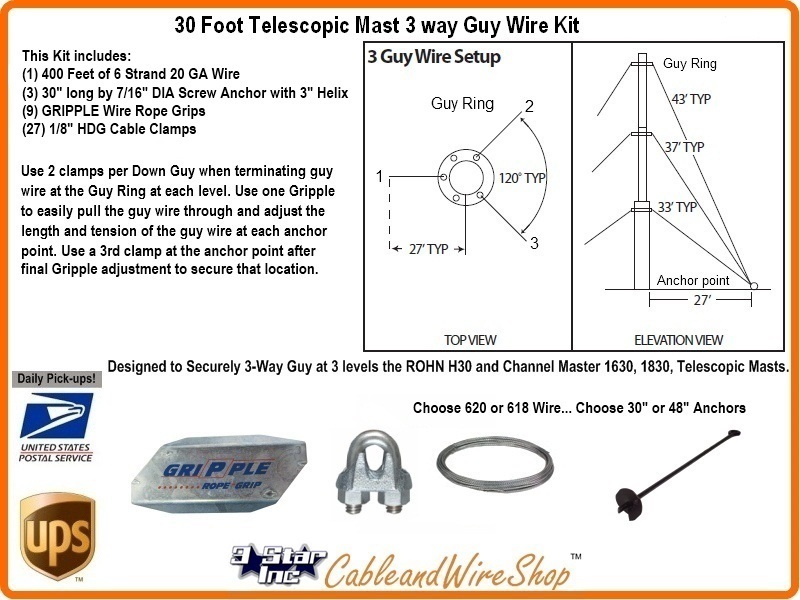 Note: This 3-Way Down Guy Wire and Anchor Kit for 30 Foot Telescopic Push Up Antenna Masts includes the Accessories needed to Securely affix a Ground Based Telescopic Mast at the 3 levels of Guy Rings supplied with the Mast for this purpose. This Kit does not include nor take into consideration any Base mount accessories or Alternate Base Structure such as a Roof nor the modification of guying necessary due to Structure Bracketing. As with all Masts, Guy wire support and Grounding are Critical to Antenna Survival.